Fresh Heather : Fruit Salad...With A Twist! Sometimes I just wake up in the morning with the desire to make something creative and different! Does anyone else get that?! This morning, I decided to create a new take on a classic Fruit Salad + Yogurt by placing it inside an apple bowl. Now, this was quite time consuming but I think, with a bit of practise it is definitely a great idea for party food, healthy breakfasts, an on-the-go snack or encouraging kids to eat more fruit! You Will Need: 1 large apple, 1/3 pear, 1/2 kiwi, 1/4 banana, 8 grapes, 2tbsp yogurt (I used 0% greek; use soy or almond for vegan), 4 almonds, 1 tbsp dried cranberry/raisins, 1tbsp squeezed lemon. 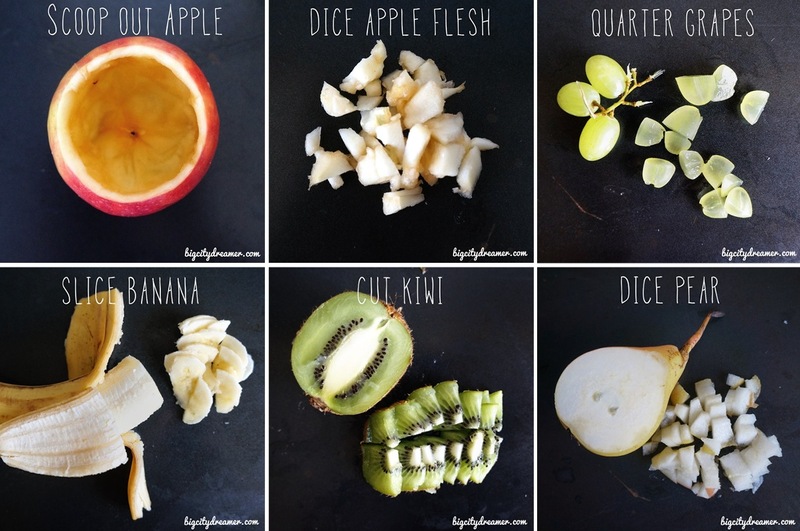 Begin by preparing the fruit: scoop flesh out of the apple and dice, quarter the grapes, slice the banana, cut the kiwi and dice the pear. Mix all of the fruit together along with a tbsp freshly squeezed lemon juice (to stop the fruit from browning) and cranberry raisins for a burst of colour. Place the first tbsp yogurt in the base of the apple followed by the mixed fruit and top with the remaining yogurt. Top with almonds, raisins and cacao nibs. Preparing the fruit: scoop the flesh out of the apple and dice, quarter the grapes, slice the banana, cut the kiwi and dice the pear. What are your favourite fruit salad ingredients? What is your favourite kind of apple? It's always Pink Lady for me! Great informative site. https://collegepaperwritingservice-reviews.com/collegevine-review/ I'm really impressed after reading this blog post. I really appreciate the time and effort you spend to share this with us! I do hope to read more updates from you.